"To keep going, we've got to be a part of something bigger than ourselves." The Orchard has debuted a trailer for The Yes Men Are Revolting, an autobiographical documentary about the "Yes Men", Andy Bichlbaum and Mike Bonanno, two "hilarious activists" that tell their own story in this film. As they explain, they have been pulling off corporate pranks for years and now are trying to find new inspiration fighting climate change. Yeah it looks a bit cheesy, but I'm much more interested in the angle of seeing them pull off their hoaxes than anything. If you enjoy activism or stories about passionate people, give this a look. For two decades, the Yes Men have pulled off spectacular media hoaxes to expose corporate crimes. Now, these activists are approaching middle age, struggling to stay inspired in their fight against climate change. Can they get it together before the ice caps melt? The Yes Men Are Revolting is a documentary directed by producer/filmmaker Laura Nix and the Yes Men. This first premiered during the Toronto Film Festival last year, and has played at a number of other festivals before arriving in theaters over here. 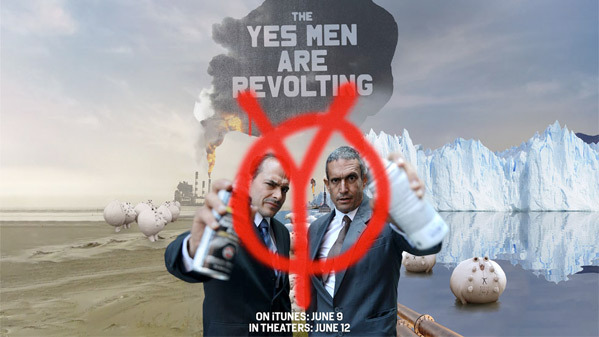 The Orchard will be releasing The Yes Men Are Revolting in select theaters starting on June 12th this summer. That is some good chit. Drilling in the arctic? Let's go!